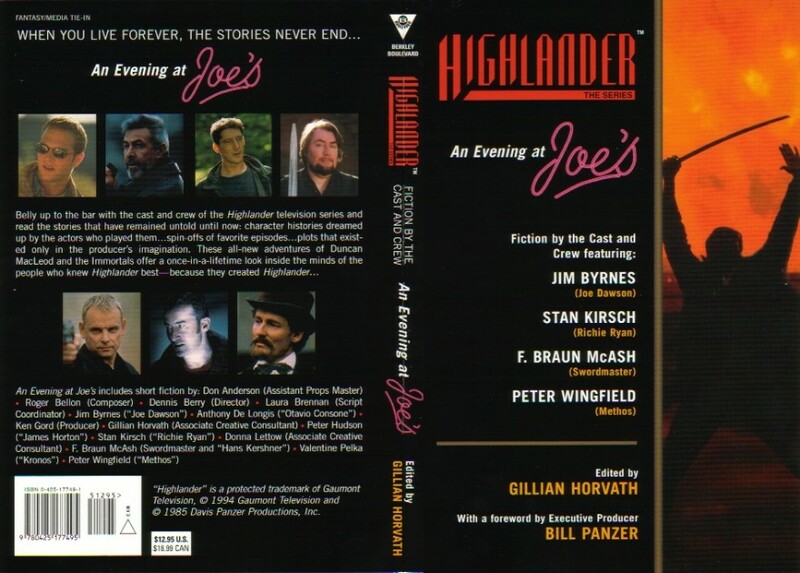 Gillian Horvath, editor for An Evening at Joe's: Stories from the cast and crew of Highlander, has posted a cover design. Visit Gillian's website for more updates. The anthology will feature stories by Peter Wingfield, Jim Byrnes, Stan Kirsch, Valentine Pelka (Kronos), Peter Hudson (Horton), Anthony De Longis (Consone in "Duende"), Ken Gord (producer), Donna Lettow (associate creative consultant, aka writer), F. Braun McAsh (swordmaster), Dennis Berry (director), Roger Bellon (composer), Don Anderson (assistant props master) and Laura Brennan (script coordinator), with a foreward by Executive Producer Bill Panzer. The volume will be out in September from the Boulevard imprint of Berkley/Ace. Letters from Vietnam / Jim Brynes ("Joe Dawson") - A young Joe Dawson writes letters to his sister and mother. From the Grave / Stan Kirsch ("Richie Ryan") - Letters from Richie to Duncan, Joe, Amanda and Methos. The Star of Athena / Laura Brennan (Script Coordinator) - Amanda steals the Star of Athena jewel and gets more than she bargains for. He Scores / Ken Gord (Producer) - Apparently Ken manages to make a connection between James Horton and Tim Horton, a real- life Canadian hockey player who started an incredibly popular franchise of donut shops in Canada. The story is written in script form. The Staircase / Valentine Pelka ("Kronos") - Val's novella is the longest story in the anthology. Ginjer Buchanan, Highlander novel writer and behind-the-scenes editor for the anthology says Val's writing is of such high quality that she would consider publishing it even if it wasn't a tie-in to a TV series. Death Shall Have No Dominion / F. Braun McAsh ("Hans Kershner" in "The Modern Prometheus" and series swordmaster) - Hans Kershner meets Vlad the Impaler aka Count Dracula. Braun said 80% of the story is true, he just filled in the gray areas with HL mythology. Ironically, just after he finished this story, Braun found out he would be working on HL: Endgame in Bucharest, Romania, and one of the film's locations is at the grave of Vlad the Impaler! This is the second-longest story in the anthology. A Time of Innocents / Peter Wingfield - Peter said his story is based on an idea he had (how nice and vague, Peter! ), writing it brought back memories of writing essays for school, and he has NO plans to embark on a writing career after this. In fact, the remark Peter got most often on his essays was "appears to have been written in haste"! Postcards from Alexa / Gillian Horvath & Donna Lettow - Adam and Alexa start their tour of the world. Pairs of complimentary vignettes alternating between Adam and Alexa's points of view. Because of the timeframe for completing stories for the anthology, Donna and Gillian weren't able to compare notes often enough to make sure the stories matched perfectly; however, Gillian said this makes them seem more like real memory where people agree on general events but details are colored according the individual's personality and POV. Thanks to Lorna for jogging my memory with some details.